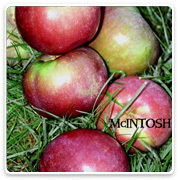 Large red apple derived from McIntosh. Long-time favorite in eastern US for fresh eating, cooking & cider. Sweet-tart, flavorful, non-browning white flesh. Early harvest, just before McIntosh. Precocious, productive tree, hardy to -40º. 800 to 1000 hours. Self-fruitful. Round, bright to dark red over green, superb quality in cool climates. Crisp, aromatic, subacid, sweet. Dessert/cooking. Early harvest. 900 hours. 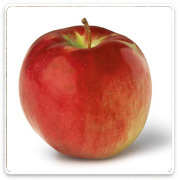 Partly self-fruitful, or pollinated by Red Delicious, Gala, or other. Deep, dark 1" red fruit excellent for baking and fresh eating. 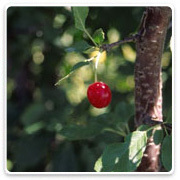 Much sweeter than other sour cherries. Extremely hardy buds. 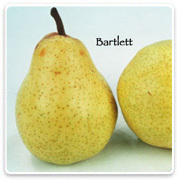 World's most popular pear. 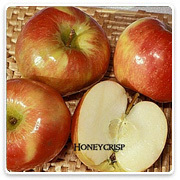 Early mid-season, high quality, tolerates hot summers. 800 hours. Self-fruitful in arid West. Elsewhere, pollinated by Bosc, D'Anjou, Winter Nelis. 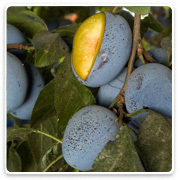 Large, dark blue skin. Juicy, sweet, delicious, greenish-yellow meaty flesh, freestone. Late summer harvest. Late blooming, extremely cold hardy and reliable. 800 hours. Self-fruitful.